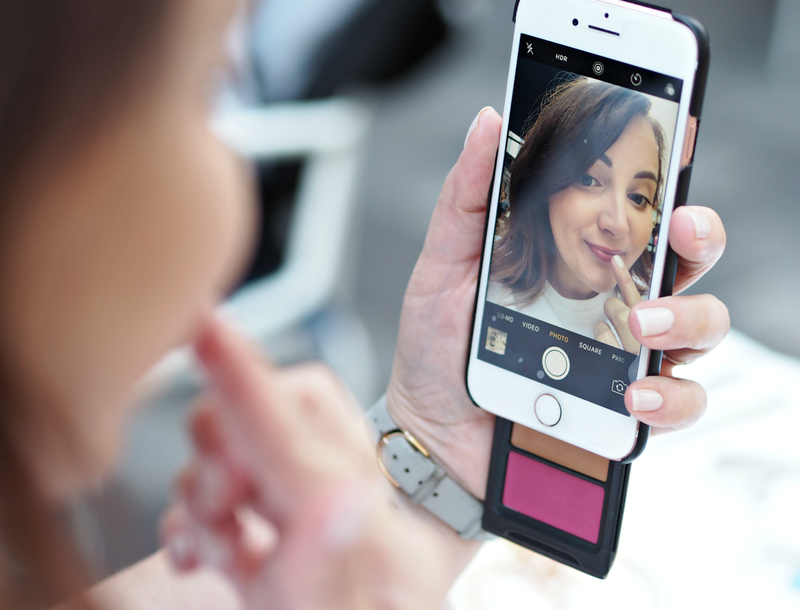 ‘Pout’ Is The Ultimate Phone Case For Makeup Lovers: On-The-Go Has Never Been So Good! Ever since my first Nokia fascia purchase (bright red in case you were wondering) I’ve been a little bit fascinated with changing up my phone to suit my mood. It may have started off with tacky phone covers and old-school fascias bought from the market for a fiver, but skip forward a generation or two and phone covers are big business – just ask Skinny Dip. They made changing up your phone and using it as a fashion accessory totally into a thing again, after years of pretty boring options and focusing on the handset itself… But now there are only really a handful to choose from, our phone case has become a way of expressing our personality and interests. (Or just our obsession with taking a great selfie!) Right now my iPhone is fashioning the latest beauty-fashion-tech hybrid that’s sure to become the latest craze amongst celebs, influencers and beauty addicts alike: the ‘Pout’ case. 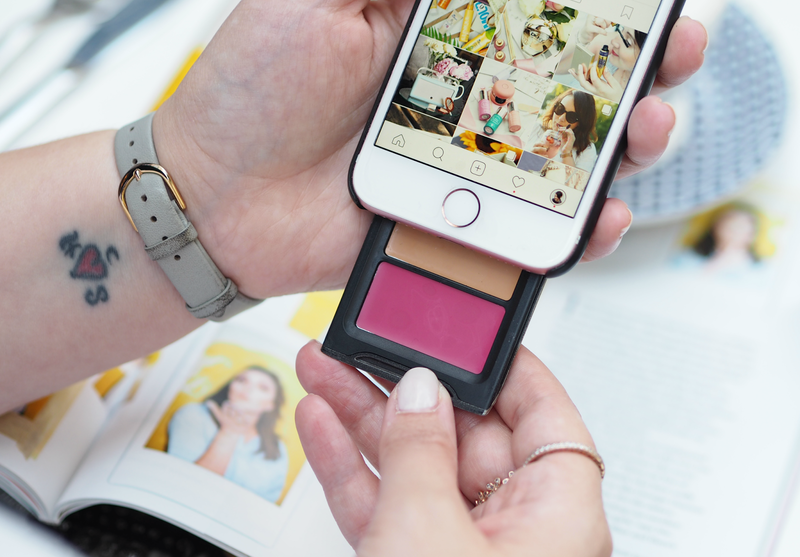 Pout is a new brand that aims to make phone cases fun, feminine and practical; they’ve combined the sleekness and simpleness we seek, with a little hidden compartment of makeup so you can touch-up on the go. Available in four colour ways (choose from a black or white base, with either a gold or pink palette) you can pick the case that suits your personal style, alongside three individual makeup products that slip inside. 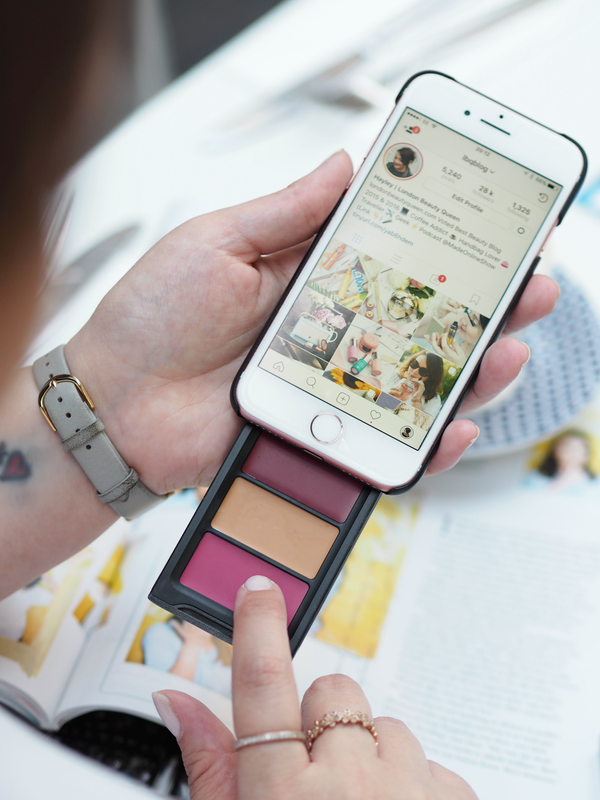 With any combination of lipstick (7 shades), foundation (4 shades) or transparent lip balm, you can create a case that works for you while still remaining sleek. (Nobody wants a case that triples the width of their phone… I’m looking at you Lumee!) For those of us that either forget to take makeup with them, or always run out of space, this is the perfect solution to a problem you may never knew existed – and they’re the best kind. Although I have the prototyped version that’s a touch thinner than it will be when it goes into full production, it’s still great quality and looks brand new despite it being chucked around for the last week or so. In terms of the makeup inside, I’m impressed with the pigment and texture (it’s creamy and comfortable without leaving a greasy film) although I’ve not been able to try the lip balm. The products may not be from your favourite brand, but Pout do claim they’re all ‘professional quality’ (whatever that means!) and I can confirm there’s not a cheap and nasty formulation in sight; they’re all you need for a little touch-up on the go or to transform your look from day to night. The main drawback for me is the price point of this rather ingenious little product: while the case itself will set you back £30.00, the trio of makeup inside will also cost an additional £20.00. That’s £50.00 for an iPhone case of makeup, which even for someone that loves a designer bag and spends way too much on shoes, is a touch too steep – especially when the cosmetics themselves aren’t branded. I really do love the concept and the execution (they could have gone tacky, overtly girlie and sickly pink, but they kept it elegant and ageless) but I just wish it was half the price. As the brand is still in its launch phase I hope they’ll be able to reduce the cost as it grows, or add in branded cosmetics into the mix (there’s so much potential here to do some interesting things!) before someone else comes along and rips off the concept for a fraction of the price. What do you think: a great idea, a waste of money or are you undecided? 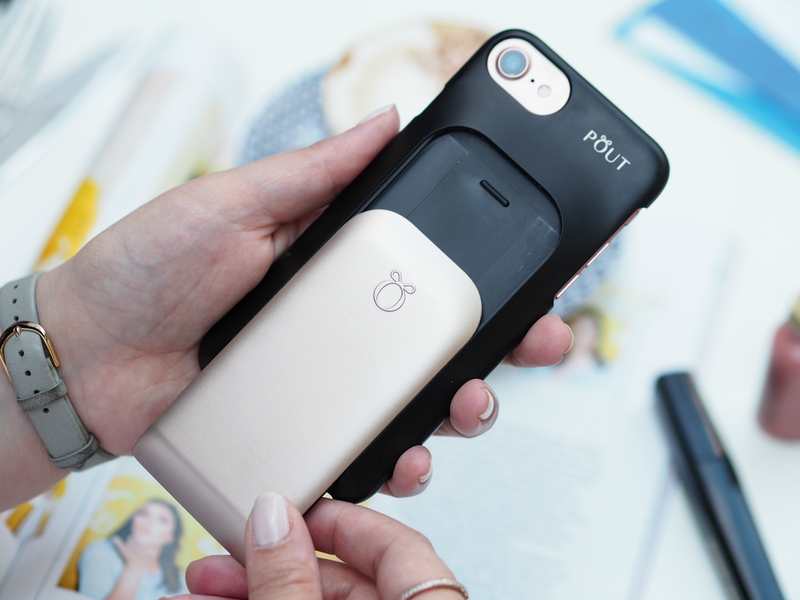 Pout have given me a little code if you fancy making a purchase – get 50% off the case with code LBQPOUT at the checkout, reducing it to £15.00. What a brilliant idea but ouch to the price tag. Will be interesting to see if any of the bigger brands jump on board this idea – nice idea for Christmas gifts! I'm sure they will – although I've just heard on the grapevine that they're looking at dropping their prices, so hoping they do! It's such a good idea for when you've only got the space of a clutch bag!